Love the red chairs! - Where can I find them? I want these red chairs. Color above wainscoting? - Looks like Ben Moore Shaker Beige which I have in my bathroom, which is on the Manchester tan pallet In store (three color card). Hope this helps! where can I get the brown floral chair? is this ceiling a smooth ceiling or skip trowel? where can you find wainscoting like that for a DIY project? What color is the paint above the wainscoting? 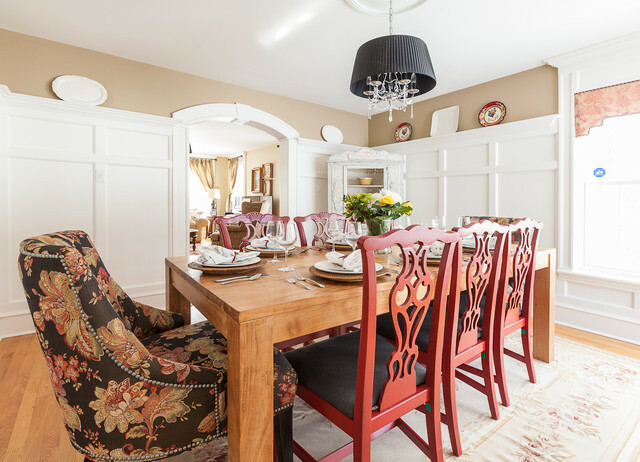 - I love this dining area....nice job with color & neutrals, print &texture. What colour are the chairs? It is a Cottage style diing room bcause f the comfy furnitures and the Whites.